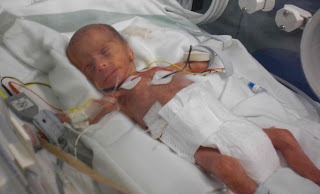 Premature babies are subjected to a number of procedures when they are born too soon. They don't show up on pictures very well but Joseph's hands and feet are covered in tiny scars, over 50 of them. The procedures carried out are essential, long lines for feeding, iv lines for antibiotics etc. The problem is, with every wound, there lies an opportunity for infection to take hold. These tiny babies are really vulnerable, and however careful one is with hygeine, infections can and do happen. An infection can lead to life threatening sepsis. The Honey Dressings Research project team at Nottingham City University Hospital has successfully started on the first part of the project, necessary to evaluate the effectiveness of using manuka honey on babies as a healing agent. Special care babies can suffer from a variety of wounds including abrasions from tubes and plaster, and bed sores. The team is looking at a Wound Assessment Tool which will enable them to evaluate pain associated with differing wounds, and is a vital stage in the investigation, to help them to assess which wounds are appropriate for the honey dressing. It is being led by Dr Jon Dorling, Consultant neonatologist and the main issue is that premature babies have very fragile thin skin which restricts the use of antiseptic dressings. The use of honey is not new, it has been used since ancient times, falling out of favour once antibiotics became in general use. However now we know that antibiotics, whilst of course a wonderful invention, have their downsides, the use of manuka honey is becoming more prevelant, and is already used in some clinical settings such as for cancer patients. The use of clinical honey is fascinating and you can learn more here. What is lacking is evidence, and this project will help collate this and see if honey dressings can help these tiny babies and prevent infection. Mother and Baby magazine have raised £80 000 towards this project. If you want to help Bliss with funds towards this and other projects for premature babies or provide resources for families please consider a one off or regular donation. As a nurse I love using honey dressings on my patients and think it's great that the research is being done for their use on babies too. Honey is a really effective at healing wounds. All the old dressing are coming back into favour these days.